ANVER is the largest manufacturer of Vacuum Tube Lifting systems in the United States with the widest selection of Vacuum Tube Lifters and Replacement Vacuum Tube Lifter Parts in the industry. ANVER VT Vacuum Tube Lifting Systems are ergonomic lift assist devices that can help increase your productivity while offering an economic solution to your material handling needs. 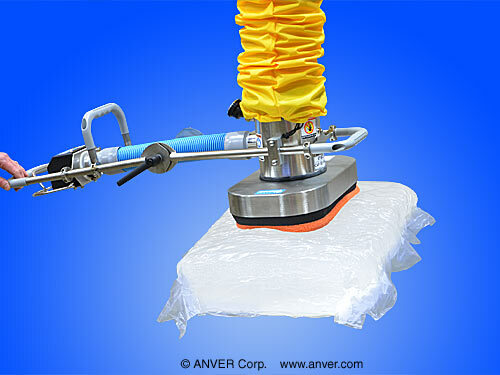 ANVER VT Vacuum Tube Lifting Systems are easy to use, simple to maintain and require minimal operator training. These Vacuum Tube Lifting Systems grab the load (via vacuum suction), support, lift and lower the load without the use of a hoist, all by means of a single operator control. 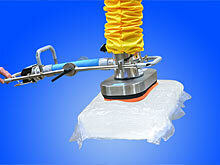 The use of vacuum suction pads for attachment allows objects to be lifted without fear of damage to the surface or edges of the product, often caused by manual lifts or grabs. A remotely connected high-efficiency vacuum pump supplies vacuum power to the vacuum lift tube to lift and lower the attached load. A Power Loss Safety Check Valve built into the 360-degree top swivel slowly lowers the load if power supply to the vacuum pump is interrupted. ANVER VT Vacuum Tube Lifting System Controls have been designed with operator ease, safety and comfort in mind. ANVER vacuum tube lifting system controls are simple to operate, require little operator training, and easily adjust to any operator’s optimum working height. The operator controls the system vacuum via two vacuum valves with adjusting knobs on the control head. The “no-load” valve sets the horizontal height of the tube lifter for attaching to the load. The”load” valve sets the height to which the load is raised after attachment. Once set, the system continually returns to these height levels for the duration of the operation. Both control valves are fully adjustable, allowing the operator to lift and lower any size load within the system’s load range. A simple readjustment of these two valves allows new height levels to be set to accommodate a change in load handling requirements. Operator’s hands and fingers remain unrestrained throughout the handling process, with no unnatural motions or straining required to operate the lifter. Repetitive stress injuries, often caused by unnatural twisting of wrists and push-pulling of locked-in fingers, required to operate competitive controls, are eliminated. An ergonomically designed control handle has made the unit a favorite among operators. The control is activated by simply squeezing the lever with the thumb and fingers in a natural grasping motion. A redesigned conical flow valve allows the operator to precisely control the vacuum power, resulting in a much smoother, more user-friendly control than competitive units. This exclusive ANVER design feature allows our VT tube lift systems to more smoothly handle a wider range of load capacities than any competitive brand. A Power Loss Safety Check Valve built into the 360-degree top swivel slowly lowers the load if power supply to the vacuum pump is interrupted. Micro-adjustment and acceleration are accomplished with the same control on the front handle that regulates air suction power. Stainless steel adjustment knobs and nylon fittings on the control head ensure accurate and consistent settings. External surfaces combine stainless steel, anodized aluminum and nylon components, all FDA approved for washdown and food service applications. The control head is manufactured using electro-polished heavy gauge stainless steel for corrosion resistance. Only ANVER VT Tube Lift Systems are equipped with a vacuum gauge on the control head to readily indicate to the operator the system vacuum level during the lifting operation. This innovative feature helps to make an ANVER VT Tube Lift System the safest to operate in the industry. ANVER’s Mini VT Tube Lift Systems have a control head similar in design to our standard series of tube lift systems, but smaller in size, making them lighter and more compact. The control head is easy to position and its near-effortless movement allows for fingertip control by even the most petite operators. ANVER’s Micro VT Tube Lift System features a compact control designed for one-hand operation and is ideally suited for repetitive lifting and packing of small objects in a confined space. An optional throttle grip control is available as an alternative to our standard squeeze-lever control. The throttle grip, incorporated into the control handle, allows the operator to regulate the load lifting and lowering by twisting the grip, similar to a motorcycle throttle. Extension handles and pad attachment extensions are available and easily interchangeable to accommodate differing load handling requirements. Extended length handles and swivel controls are available to make high load stacking easier. Quick disconnect pad attachments are available, allowing the operator to quickly change the pad attachment for differing load configurations. Optional gravity tilters are available for applications calling for repeatedly tilting the load from vertical to horizontal. An indexing plunger holds the pad in place for vertical attachment to the load. Item for item, ANVER offers the highest quality vacuum tube lifting system, which is the key to our continuing success. We invite direct comparison to any competitive system. Our VT system’s heavy gauge micro-polished stainless steel construction, along with the finest control valves, pumps, pads, hose and filters available, all combined with our economical prices, have rapidly made ANVER the standard in the industry. ANVER VT Vacuum Tube Lift Systems are ideal for repetitive handling of either non-porous, semi-porous or porous loads. Models are offered to handle loads of from 5 lb (2.3 kg) for non-porous loads, all the way up to 660 lb (300 kg). ANVER Vacuum Tube Lifting Systems are rapidly becoming the system of choice where single operator handling of repetitive or heavy loads is required. Systems are in use at many of the largest US manufacturers, yet their affordable pricing and ergonomic features have made them a practical tool for even the smallest companies. Vacuum tube lifters are being used for packing small appliances, electronic equipment, furniture, virtually any item to which a vacuum suction pad can be attached. Palletizing, stacking, loading and unloading bags, sacks, cartons, printed material, buckets, drums, pails and woven goods are among the typical uses. Raw materials can be lifted and lowered into position for weighing, emptying, or mixing ingredients in the food, chemical or pharmaceutical industries. ANVER VT vacuum tube lifting systems have also found their place in the manufacturing assembly process for lifting and placing items into position, such as lifting a TV picture tube into its chassis. Since 1968, ANVER has been manufacturing an extensive line of vacuum lifting systems, including vacuum tube coil lifters, wood panel lifters, tilters and rotators. Our applications engineers can provide a thorough technical review of your system requirements and help you to select the right vacuum lifter for your needs and budget from our extensive range of standard and specialized vacuum lifting systems. ANVER includes select models of high efficiency vacuum pumps specially designed for ANVER as part of its vacuum lifting systems. These quality vacuum pumps are made from tough, high-strength materials for long life and are lightweight and virtually maintenance free. Their highly efficient, state-of-the-art design has made older designs of conventional side-channel vacuum blowers obsolete. Vacuum pumps are available in capacities of up to 480+ cfm flow and 18 in. Hg vacuum. Powered by high quality TEFC motors, they are more energy efficient, require less horsepower to operate than competitive models, and are offered in several sizes to match your vacuum lifting requirements. Compressed air powered vacuum pumps for specialized handling of smaller loads or for use in explosive environments are also available from Anver. Auxiliary compressed air powered lift assist vacuum tube lifters are available for special load handling or high load stacking applications. Vacuum Tube Lifting Systems can be easily upgraded to larger sizes with adapters in the field. The top swivel mount is made of stainless steel, and features a vacuum-tight totally sealed bearing for full 360-degree rotation. A Power Loss Safety Valve allows the load to slowly lower in case OF power supply interruption. Hundreds of standard size vacuum suction pads are stocked for immediate shipment, and custom vacuum pad attachments can be manufactured for special applications. ANVER builds pad attachments that are available nowhere else. ANVER Vacuum Tube Lift Systems have the lowest cost-in-use due to our low replacement parts prices and our use of maintenance-free, direct drive vacuum pumps. ANVER is the leading source for spare vacuum tube lifter parts, vacuum pumps, motors, vacuum pad attachments, vacuum hose, controls, etc. Our huge stock of quality parts includes every competitor’s vacuum lift tube size at half the competitors’ prices! Replacement parts are available from stock. Call us and see why our quality, service and prices have set the standard in the industry.